On June 29th, 2007 Steve Jobs unveiled the Apple iPhone— forever changing the way we live, communicate, make purchases, and receive information. Fast forward 11 years, the smartphone is almost an extension of our bodies. Our smartphones have become as important to us as the air we breathe, and for good reasons. It’s no surprise that this brilliant technology would one day shape our health, well-being, and our relationship with medical practitioners and medicine. Mobile health, or mHealth, is defined as the support and usage of mobile devices and technology in medical health practice and care. 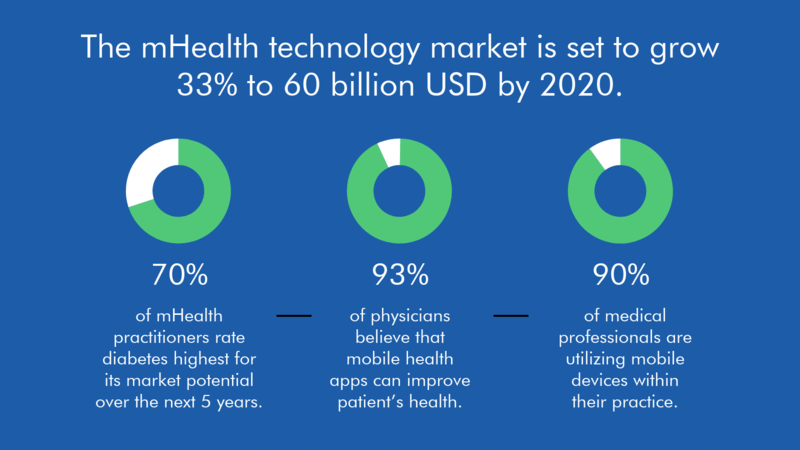 mHealth is the next step in this frontier for a better way to live, and medical professionals are adopting mHealth into their practices at a staggering rate. All the Hype: What are mHealth apps? Mobile health apps, or mHealth apps, are mobile apps used in a healthcare setting. With over a half million mobile health apps on the market, these apps present solutions to obstacles in healthcare in the categories of disease supervision, treatment care, disease management, and so much more. 80% of surveyed physicians use their mobile devices to assist in their day-to-day practice. 79% respondents to a survey say that that they feel more connected to healthcare providers who don’t spend lot of time on paperwork during visits. 93% physicians find value having a mobile health app connected to Emergency Health Services. 31% of surveyed organizations offer a specific app for patients while 30% are currently developing an app. mHealth is making it more convenient and more efficient to communicate with our medical services and their doctors. Patients are using video chat, online chat and text to communicate directly to their physicians, saving time spent going to their office and money on expensive visits. Immediate solutions to issues can be quickly handled by mHealth solutions from device to device. Doctors and nurses are equipping themselves and their staff with tablets in the office and hospital to ensure their available access to their patients. Many times in a medical emergency, time is of the essence and mHealth technology is making it possible for medical professionals to save more lives, and help those in need without having to see them in person. FitBit, Apple, Samsung, Garmin and many others have manufactured wearable devices that help us monitor our health, diet, sleep and well-being. As more and more medical professionals create and connect mobile health apps that can be used by wearable devices, the link between a healthy living and humanity will grow closer and closer. Humankind is more health conscious than we have ever been, and wearable technology coupled with mHealth apps are playing a major role in that shift. A large part of our society’s health issues occur in rural, remote and desolate parts of the world. Third-World countries suffer the most, with lack of attention, accessibility, resources, and money to treat those in need. mHealth offers solutions to expeditiously get treatment and information to those living in rural and isolated parts of the world. This technology will bring great relief to humanitarian workers and world leaders as we try to eradicate global disease and hunger. With mHealth and smart devices, we have never been more connected as a global civilization. mHealth technology offers countless benefits that will help us shape the way we live today and build a stronger tomorrow for the future of mankind, our healthcare, and well-being. If you need a mobile healthcare app or have a mobile healthcare app idea, we can help! Our healthcare mobile app developers create iOS and Android medical apps. From hospitals and medical professionals, to service providers down to patients, we understand the requirements for a mobile healthcare app for the medical industry. Contact us online, or call us today at (404) 835-7730 to discuss your mHealth apps needs!